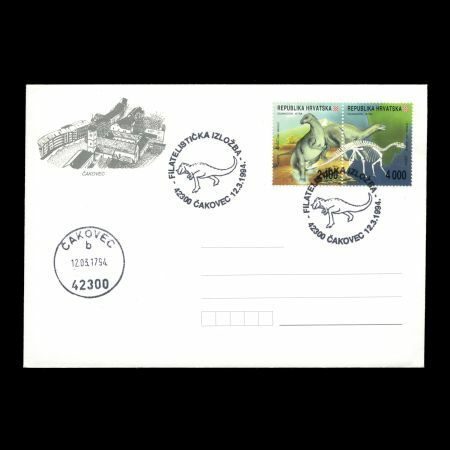 Croatia 1994 "THE COASTAL DINOSAUR FINDS IN WEST ISTRIA"
Although animal fossils have been studied for centuries, the dinosaurs remained mostly hidden until rather recently. In the 1840s, when Sir Richard Owen was studying the reptile fossils discovered in England, he concluded they could not be compared to the living reptiles. He hypothesized that their size and appearance must have been fearsome and thus coined the word "dinosaur" from two Greek words "deimos" (fearsome) and "sauros" (reptile, lizard). The first dinosaurs appeared about 230-225 million years ago and were to dominate the earth for almost 170 million years. They suddenly vanished 65 million years ago at the turn of the Jurassic period to the Cretaceous period. 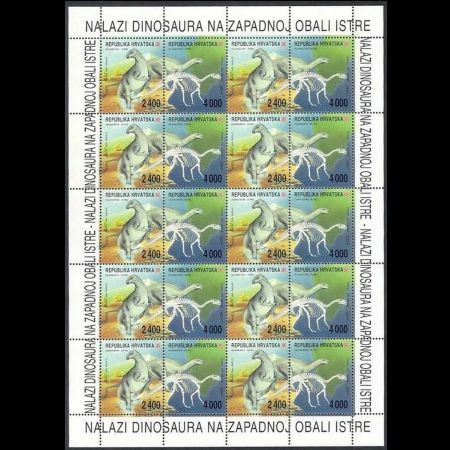 The dinosaur footprints discovered in Istria on different locations have not been subject to thorough investigation, such as the island of Fenoliga, the island of Veli Brijun, the Cervar Bay, the river mouth of Mirna. The Location on the sea floor south of Rovinj is the only coastal site in Istria and in the Mediterranian basin. 1994 marks the beginning of an interdisciplinary joint research project carried out by the scientists from the Zagreb Institute of Geological Research and experts from institutes and Faculties in Croatia and Italy. The objectives of these investigations are animal fossils and their ancient habitats-i.e. 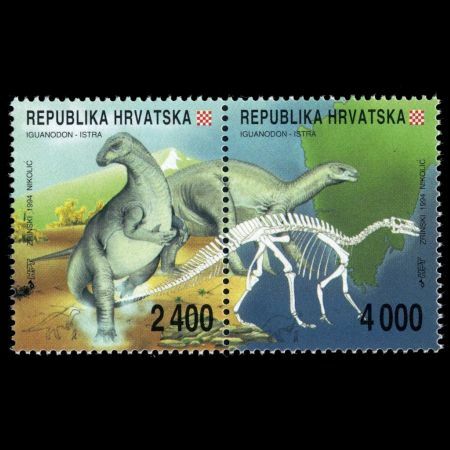 the paleoecological situation in the period when Istria was the habitat to dinosaurs. 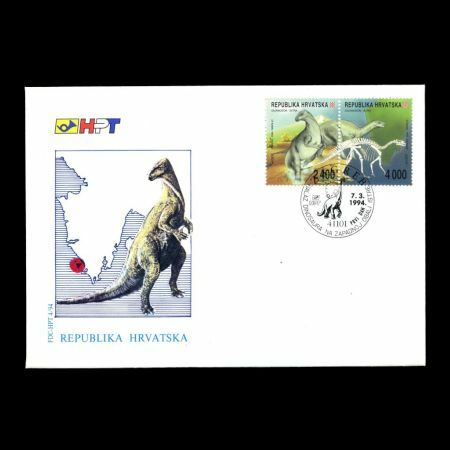 The Croatian Post and Telecommunications issued a First Day Cover and a First Day Sheet.